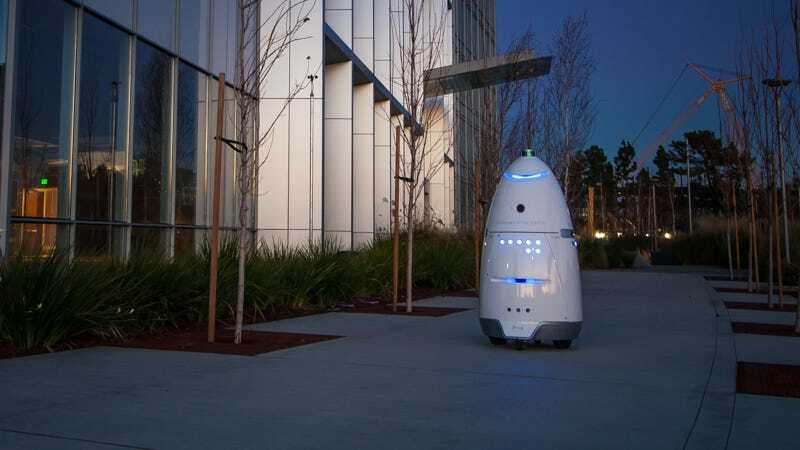 The Stanford Shopping Center has suspended its security robots following an incident last week in which a 16-month-old boy collided with one of its machines, resulting in a minor injury. The toddler, Harwin Cheng, was walking in front of his parents outside an Armani Exchange store when his mother pointed out the robot coming their way. The child didn’t notice the machine, and he bumped into it, falling forward. According to the mother’s accounts, the security robot just kept on going, running over Harwin’s foot and resulting in a nasty bruise. In response, the Stanford Shopping Center in Palo Alto, California, is investigating the incident, and it has docked its robots until further notice. The company that developed the robot, Knightscope, called the incident a “freakish accident” and has issued a formal apology to the family. “Our primary mission is to serve the public’s overall safety, and we take any circumstance that would compromise that mission very seriously,” said William Santana Li, Knightscope’s chief executive. The company claims that the machine, a K5 unit equipped with nearly 30 sensors, should have registered a vibration if and when it ran over Harwin’s foot. The incident prompted Knightscope to file a field incident report—the first such report after 25,000 miles of total travel made by its robotic fleet. The company’s account of the incident varies a bit from that of the mother’s. Knightscope claims that Harwin ran backward “directly” into the machine, prompting the robot to stop, and that’s when the child fell. Regardless of what happened, there’s no disputing that a child got hurt, even if it was a minor injury. Malls may find it cute and expedient to have robotic security guards roaming the corridors, but they clearly need to take account of these mechanical lumbering beasts which weigh 300 pounds and stand five feet tall.